Server Hot Spots are becoming more common with the introduction of blade servers. Data Centers designed for 3KW racks are being asked to support 10KW and higher rack density. Often there is enough cooling CAPACITY, but insufficient DISTRIBUTION. 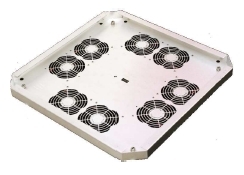 The HotSpotr™ HT-500 line of underfloor air movers has been specifically designed to quickly and reliably solve a variety of Data Center cooling issues caused by poor air distribition or rack placement. Self installed in 30 minutes, results are immediate. Cooling air is delivered where, when and in the right amount. Proper airflow distribution is the key to providing cooling to ever higher density server racks. Failure to deliver enough cooling air to rack intakes causes recirculation of hot air and overheating of servers. Under floor obstructions such as pipes, cabling, cable trays etc. causes low static pressure and reduced flow from some perforated tiles and grates. Racks placed too close or too far away from CRAC units also face issues with low and even negative static pressure. The result is many data centers are overcooled just to manage a few hot spots. mounted underneath a grate or perforated tile; HotSpotr delivers cooling air where, when and in the right amount. HT-500 operates in one of two modes. In Stand Alone mode, sensors placed at the rack top intakes sense the critical rack temperatures. The smart controller maintains proper cooling by dynamically varying the fan speed. In the Networked “Room Scale Intelligent Cooling” mode, several HT-500s and overhead HT-710s plus additional sensors are networked to a central controller. This controller then monitors the thermal health of the entire data center and actively manages airflow distribution to match the heat distribution in the room.